When I was a kid, I was more tomboy than bookworm. I had brothers and boy cousins, and rather than read, I played Spud and Kick the Can. When I did read, I read more comic books than book-books. More Archie and Richie Rich than Ramona and Nancy Drew. But I always enjoyed returning to the colorful and comforting picture books of my childhood, and I liked reading Aesop fables and Greek myths and Grimm fairytales because they were short and packed a punch. My parents were writer / editors and we played a lot of Scrabble. I also kept a diary from about age eight on. I still have those early diaries. Yes, Nerdy Book Club, while I was not a natural born reader, I was a word nerd from the get-go. I even remember learning the letter “I.” It was just one small line with a smaller line at the bottom and a matching one at the top, yet it meant soooo much. What a useful thing, this letter, this word, these lines. I was so impressed! Later, when I learned how to spell “here” and “there,” I was unimpressed. Why didn’t “here” and “there” rhyme, for Pete’s sake? Confession: there’s a lot of me in Ava Wren, the ten-year-old diarist in AVA AND PIP. In middle school, at bedtime, rather than curl up with a book, I wrote in my diary about friends, crushes, and babysitting jobs. By high school, however, I’d become acquainted with enough wonderful short stories and novels that I finally “got” it: Reading opened up worlds! I spent twelfth grade in France, and at Yale, I majored in French and Spanish Comp Lit and powered through long books like The Red and the Black and One Hundred Years of Solitude. In the original, no less. I went on to earn my M.A. in Spanish through Middlebury. Words, words, words! I couldn’t get enough of language and languages! Rob and I had two daughters, and in 1991, I joined a book club. I’m still a member! I keep a notebook in which I write all the titles of books I’ve read. I add a check if I really like the book. Our kids were little when I landed a plum assignment at Redbook to run their Top Ten Picture Books of the Year Awards. For four years, I read every single new picture book. Among our chosen winners were Teammates; Mouse Paint; In the Tall Tall Grass; Animals, Animals; andThe Incredible Painting of Felix Clousseau by Jon Agee. When our girls were about ten, I joined two different mother-daughter book clubs. Each lasted several years. Books books books! I’m proud that my daughters, now grown, both read for pleasure. And that now I do too. I’m also proud that Jon Agee blurbed my new novel. I had to scour the Internet to find his address, but since he wrote not just Felix Clousseau, but Go Hang A Salami, I’m a Lasagna Hog, I knew that he was a word nerd and I hoped he’d like Ava and Pip and Anna and Bob, my fictional family with a passion for palindromes. Y-A-Y! Agee did! Now I hope kids everywhere will like reading about Ava Wren, the good kid who does a bad thing and who learns about the power of words. Carol Weston is the author of the soon-to-be released AVA and PIP which is illustrated by Victoria Jamieson. (Sourcebooks / Jabberwocky Kids, March 2014). You can find her online at http://carolweston.com/ and on Twitter as @carol_weston. Sweet on the REDBOOK assignment! 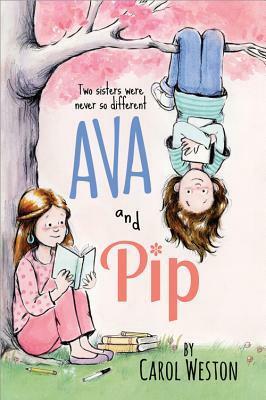 Looking forward to reading AVA and PIP! Yes, being paid a little to read to my kids a lot – -that was a great gig! Would have done that forever…. Me too! Love the cover! Y-A-Y to Victoria Jamieson!! Thank you so much for this book! No sooner had I placed it on my desk under a sign for “New Releases” and it was whisked away. My fifth grade students are enchanted by word play, so it is the perfect fit. The student who is reading Ava and Pip keeps updating her classmates about the plot. She is so into the storyline and the word play! I can tell it will be a huge hit in my classroom. Thank you! How wonderful to read these words. Please tell that student that I’m her fan too! !